As of February 2016, after 416 posts, and over six and a half years of blogging, I'm taking a break. I've explained why here. There's plenty of past posts to read, though - hope you enjoy them ! Amazon US and worldwide but buy from a local bookshop if you can. 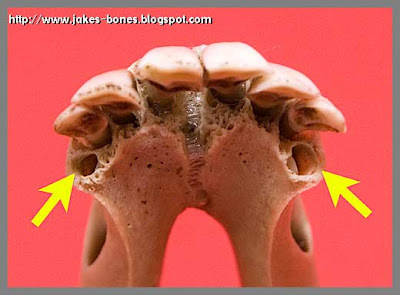 This post is about cleaning bones . 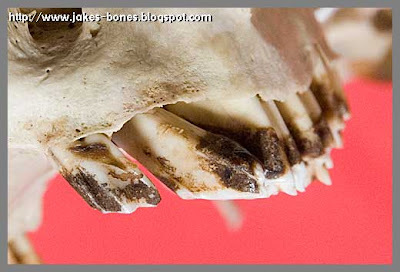 I have written a complete guide to everything I know about cleaning bones here . 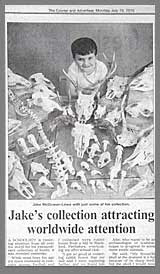 At the start of the year I wrote a post about the five skulls I would like to find this year. One of them was a perfect sheep skull, with both horns and both jaws. I have found loads of sheep skulls before, but none with all five parts. 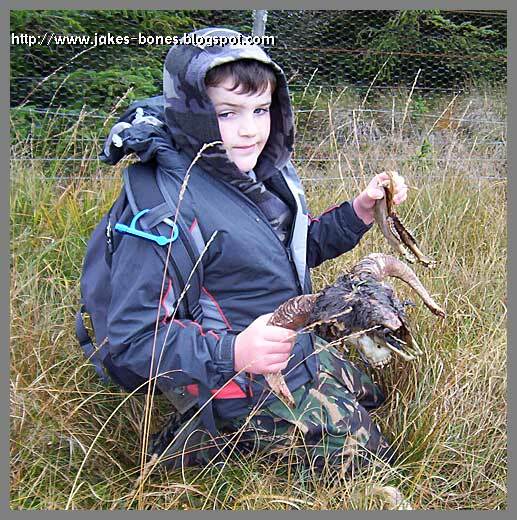 I found a great sheep skull on Sheriffmuir, but one on the jaws and one of the horns was missing. I've found three sheep skulls which have lower jaws, but which were female or didn't have horns. 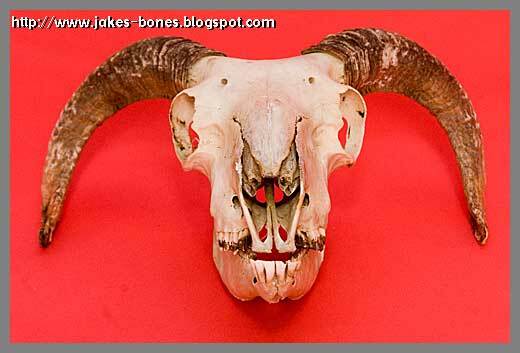 And the closest I came was this skull which I called Montferno from Titus Well Moor which had both horns but only one of the jaws. I was starting to think I would never find a perfect sheep skull until two weeks ago when I was on a walk with Dad in Titus Well Wood. We were climbing up to the top of the hill to see if we could see the red deer when we found a dead sheep at the edge of a sheep field on the moor. This was me after I just found the skull. It was pretty grotty because it still had some last bits of skin over the scalp and the eye socket, but Dad pulled that off with his knife. Once the last bits of skin came off I put it in a bath of biological washing powder. I didn't use peroxide on this one because I've been told museums don't use peroxide because it's easier to see the detail on the bone if it's not bleached. This is what it looks like from the front. It has all the teeth and all the incisors. This is what it looks like with the horn off. 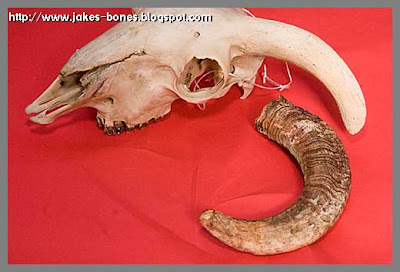 Horns are different to antlers. Only deer have antlers, and antlers are hard bone which fall off every year. Horns have two parts. Inside is solid bone attached to the skull, and this bone is called the core. Around the core is the horn, which a bit a bit like fingernails and made of the the same thing as human hair. Horn can rot really quickly when the animal dies. I was really pleased that it had the incisors, because incisors can fall out easily and when they do they are impossible to find again. It only had six incisors, but I think the two on the edges hadn't grown through yet. You can see the incisor on the right still in the hole. That might mean the sheep was young if it's teeth were still growing. All six cheek teeth have come through. 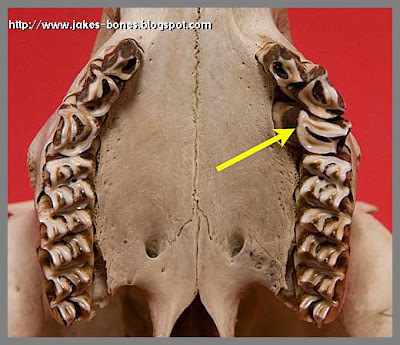 The front three are called pre-molars, and the back three are the molars. One of the second pre-molars was a funny shape, though. When I looked I saw the tooth had grown wrong and looked funny because it had come down at an angle. Here's a picture of a sheep which has horns the same size. In it's ear you see the ear-tag. 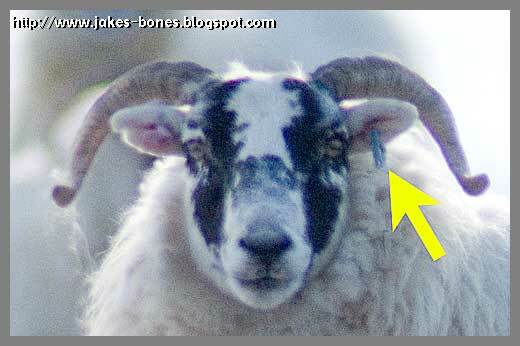 All sheep have to have ear tags which are a bit like registration plates for sheep so you can tell them apart. 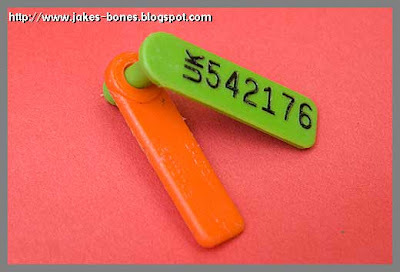 Although the ear had rotten away, I found the ear tag near the body. This was a great find, and probably one of my best skulls yet. It gets even better, though, because further up the hill we found another dead sheep with horns which will be rotted down in another month or so ! Enjoy this post ? Share it ! 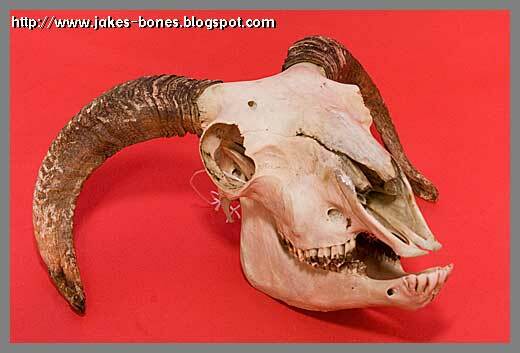 Thank you for providing such a clear description of the sheep skull. I discovered one yesterday, but I wasn't sure what it was then. I should have guessed, as we have a farm next door with a lot sheep and cattle! 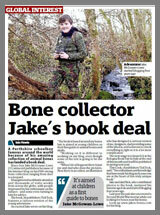 I'm Jake McGowan-Lowe and I am a bone collector, naturalist, blogger and author as seen on BBC's The One Show, Autumnwatch, Winterwatch, CBBC Wild, Newsround and BBC Breakfast. 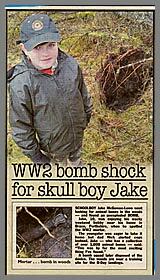 I've appeared on the BBC alongside such experts as Sir David Attenborough, Chris Packham, Nick Baker and Ben Garrod. BBC Wildlife Magazine says I'm one of the 50 most influential conservationists in the UK, and The Courier ranked me as the 24th most influential person in 2015. I am fourteen years old, and I live in a beautiful part of Scotland. I love walking, exploring, watching wildlife and collecting bones. 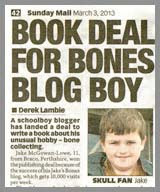 I've been collecting bones since I was six, and I blogged here every week between July 2009 (when I was seven) until February 2016, when I took a break. You can read more about why I began blogging here, and my advice to other kids wanting to blog here. 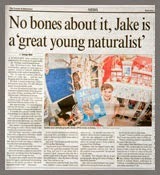 Jake's Bones: The book ! Like this blog ? Buy the book ! 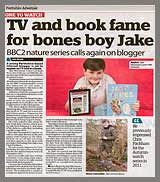 This blog and my collection led to a book deal for a brilliant childrens' book published by Hachette Children's. It's now been published in the UK, Ireland, the USA, Canada, South Africa, Australia, New Zealand, the Netherlands (called Het Grote Bottenboek van Jake) and South Korea. It was even shortlisted for the prestigious Royal Society 2015 Young Person's Book Prize ! You can read more about how I got a book deal here, this is what it looks like, and where you can buy it ! • As read by the British Royal Family ! What's in John's Freezer ? or get notification of new posts via Facebook, Twitter or RSS. 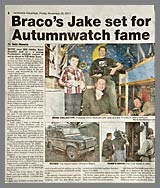 There have been stories about me in The Times, the Daily Telegraph Magazine, the Daily Mail, the Mail on Sunday, The Sun, Scotland on Sunday, the Sunday Mail, the Dundee Courier, the Perthshire Advertiser, the Stirling Observer, on BBC Radio Scotland, on the STV news, and I've even been on CBBC Wild, CBBC Newsround, The One Show, BBC Autumnwatch and Winterwatch ! 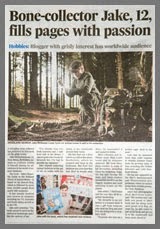 You can read all of my press coverage, magazine articles and TV appearances here.